Looking for menu ideas and foods for celebrating St. Patrick's Day? You'll find them here! There's a "wee bit o' Irish" and some "wearing o' the green" in this St. Paddy's Day collection of party foods. 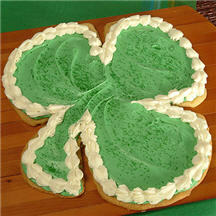 Celebrate the 'eatin' of the green' on St. Patrick's Day with this super easy, edible shamrock. Who said playing in the mud wasn't a good idea? 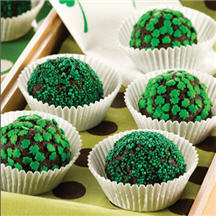 These "mud ball" delights are dipped in colorful candy sprinkles and shamrocks for a festive twist kids will love. 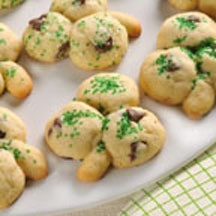 Mini chocolate chips are baked into these colorful shamrock-shaped cookies for a fun St. Patrick's Day treat. St Patty's Day "Green Eggs and Ham"